This beautiful new Chicago Skyline bat rack is now available for Chicago baseball fans who want a sleek and eye-catching way to display collectible bats. This NEW Chicago "Skyline" display rack is the perfect complement to your collectible bats. 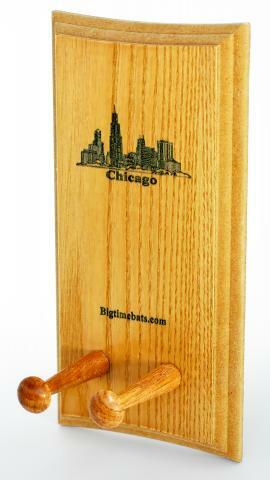 Each rack is laser engraved with the iconic Chicago Skyline and comes with the hardware necessary to hang it on your wall for displaying your favorite Championship Bat or any commemorative bat honoring your favorite team or player. Although the Cubs are currently enjoying a 100+ win season, we know Southside fans will love this display for their collectible bats.